One night over the holidays, we opened up a box of the game Reverse Charades to play the game and see what it was all about. We have the 6+ version and we played with my four family members plus my parents. It was such a blast. The directions call for at least three teams but we divided up into two teams since we only had 6 players. 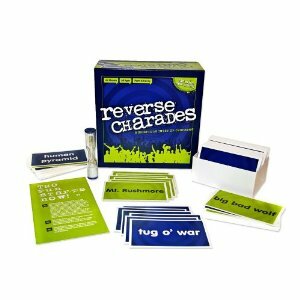 Reverse Charades is just like the traditional game of Charades you are used to, only there’s a slight twist. Rather than one person acting out the clue to a group of their team mates, it’s the other way around – a team of people act out to only one team mate – and that group of people has to go through as many clues as they can until the timer runs out. It’s loads of fun. We fed off one another watching more than one person act and we were in hysterics many times! The funniest part was my 6 year old – who decided that his acting part for EVERY clue should be “play dead,” and he’d close his eyes and lay on the ground. It didn’t take us long to figure out that a dead person on the ground wasn’t the clue each time but we nonetheless were totally laughing every time he did it. A great extended family fun game for sure and if you’re looking for something to get the party going at your next family party, this is it. Get Reverse Charades on Amazon for $21.99.